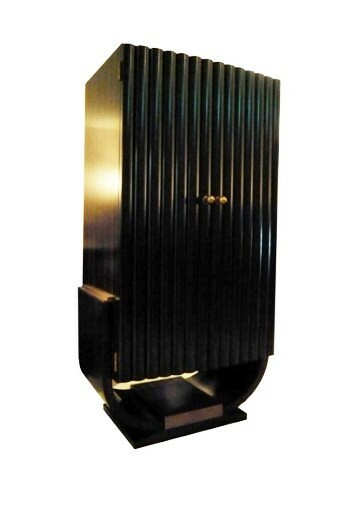 This beautiful small Macassar and black lacquer cabinet was originally used as a cocktail cabinet. Here we have installed filing drawers useful for an office. The front of the cabinet slightly curves by varying the depth of each flute on the front of the doors. All done meticulously, by hand. It is supported by a lyre base and double ogee platform. Bronze is featured around the platform, the tops of the lyre, and the door handles and hinges.